Think your high school drama club had, well, drama-filled personalities? 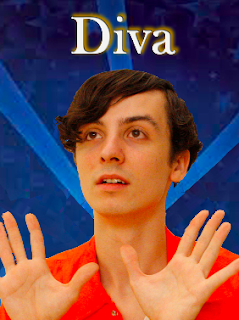 I can tell ya they had nothing on Desmond Channing, the fictional (let's hope he's only a creation) title character in the wonderfully funny solo play Diva by Sean Patrick Monahan. The story follows the final performance of the teenage club president who is about to get the chair. The electric chair that is. What would lead a kid to get executed? Well Desmond's got a song and dance prepared that will wow you! Desmond is experiencing a downward spiral after he learns that not only is the drama club losing their funding for the year but he will be forced to spend his senior year performing the public domain's Pirates of Penzance. Could it get any worse? Sure it can! A ringer, a new kid in school who happened to be on Broadway at age 9, will be playing the romantic lead opposite the girl Desmond "likes." Desmond goes forth on a revenge journey only Shakespeare could conjure up that ultimately leads to his demise. Monahan plays Desmond with a hilarious flair. He makes the closet case a stereotype that is over the top in all the right ways. He shows his range as a performer with his supporting players, that includes the old-timey drama teacher, the hot shot new kid, and the sidekick stage manager. Monahan has created a cast of characters that builds a world of nostalgia for the audience. We may not know Desmond Channing (who's name must be no accident) but we knew many kids like him. He has devised a world that is flashy, breaking out into song mid monologue, that works wonders for the conceit of the show. With the support of director James Presson, the flow of the piece is consistent and paced beautifully. Solo shows can be tough, but Sean Patrick Monahan didn’t seem to break a sweat. Both Monahan and his story are engaging, offering a wonderful night at the theater. There are only two more chances to see Diva, but I have a feeling there will be many more post festival.